El Best Western Aladdin Inn se encuentra en el centro de Kelso. Venga y disfrute de las mejores atracciónes turísticas cerca de nuestro hotel. Precios bajos garantizados y ofertas exclusivas. Las familias apreciarán especialmente nuestra piscina. Los huéspedes se sentirán magníficamente tras visitar el centro deportivo. Desde la carretera I-5 en dirección norte o sur: tome la salida 39. Vaya en dirección oeste durante aproximadamente 1,5 kilómetros, gire a la derecha en la calle Main Street y a la derecha en 5th Ave. En el interior de este hotel exclusivamente para no fumadores de Kelso los huéspedes podrán encontrar unas relajantes habitaciones en las que descansar durante su visita a la zona o durante su viaje a las playas de Washington. Nuestro hotel admite mascotas. Póngase en contacto con nuestro personal para informarse acerca de las restricciones. Todas las habitaciones cuentan con cocina pequeña y están equipadas de forma muy completa con televisor con pantalla plana y canales por cable y acceso a Internet de alta velocidad. Este hotel BEST WESTERN de Mount St. Helens proporciona también un desayuno completo gratuito todas las mañanas, una piscina cubierta climatizada y servicio de lavandería. En las inmediaciones de este hotel de Kelso, los huéspedes podrán disfrutar de unas magníficas vacaciones. Los entusiastas al aire libre adorarán las actividades de senderismo, escalada, ciclismo y muchas otras en el Parque Nacional Mount St. Helens. El Lago Sacagawea y los ríos Columbia y Cowlitz proporcionan un fantástico entorno para practicar la pesca o deportes acuáticos. Los aficionados al golf podrán escoger entre los campos de Mint Valley, Three Rivers y Lewis River. Los huéspedes podrán encontrar una gran variedad de tiendas, restaurantes, actividades de ocio y festivales en las proximidades del hotel. Durante su visita a la ciudad no se pierda un recorrido por el monumento volcánico Mount St. Helens. ¿Se encuentra en viaje de negocios en Kelso? Haga negocios de forma fácil y cómoda durante su viaje al alojarse en el Best Western® Aladdin Inn de Kelso. Weyerhaeuser, el Puerto de Longview, Fibre Channel y el parque industrial Mint Farm están situados en las proximidades del hotel. El Best Western® Aladdin Inn le proporciona el espacio de alojamiento idóneo durante su visita a Kelso. Realice su reserva en línea hoy mismo y ahorre en este excepcional hotel de Kelso con el mejor servicio de atención al cliente de la ciudad. Consulte el menú desplegable "VER MÁS TARIFAS" situado sobre estas líneas para obtener un descuento especial del 15 % en nuestra tarifa especial Best Western Rewards, descuentos para huéspedes gubernamentales, tarifas especiales para estancias prolongadas y otras promociones. Positives were friendliness of staff, clean room, convenient location, and a really great shower. We didn't try the breakfast. On the less favorable side we didn't find the bed all that comfortable and the biggest down side was noise from the room next door. It sounded like the conversations were happening IN our room, not next door. For the Longview-Kelso area I'm sure this property is near the top of the list but the noise factor would probably cause us to try another motel if our travels take us back to the area. Hi, thank you for taking the time to share about your stay at our property, I am especially excited to hear that you found our staff to be friendly! We strive to always provide the best service possible. But I am sorry the neighbors where so noisy. We do have plans to do some updates and we are trying to see if we can get better insulation in the walls. We are hoping this will help limit the noise from neighboring rooms! We hope you had a safe trip back home and hope to see you again in the future. Brad is great. Keep up the good work,. I did get my car broken into my first week. Parked in the back and it wa unfortunate but all in all it was fine. Breakfast was the same thing over and over with no deviation. The hostess was great and very nice. Hi Joel, I'm happy to hear that your stay with us was enjoyable! I am especially excited to hear that you found our staff to be AMAZING! We strive to always provide the best service possible. I do apologize for your car being broken into but I'm glad everything worked out. As for breakfast we would love suggestions on how to improve it! We look forward to seeing you again in the future! "PERFECT FOR MT ST HELENS STOPOVER"
Stayed here for 1 night at the end of August 2018 on our road trip. Wanted somewhere not too far away after visiting the amazing Mt. St. Helens. Have to say I was pleasantly surprised. Easy to find and just a short drive off the highway. We had a huge room with kitchen and bathroom. All very clean. Loads of free parking. Had a good meal in the Chinese restaurant right next door and a good buffet breakfast in the hotel the next morning. Would definitely recommend this hotel for a stopover. Hi, I'm happy to hear that your stay with us was enjoyable and that you enjoyed our breakfast! We look forward to seeing you again in the future! Hi Kimberly, I'm happy to hear that your stay with us was enjoyable and that are staff was wonderful. I'm so glad you liked our kitchen units, they come in handy when you like to cook! We look forward to seeing you again in the future! My boys and I were very disappointed with this place. During checkin we were treated as if we were dishonest and trying to scam them. I was over charged for my stay by almost 40.00... they tried to charge me even more I believe it was an additional 50.00 for a roll away bed and for my son to stay in the room overnight. Hi, I do apologize for the stuff making you feel dishonest. You where not over charged for your second night stay because you stayed in a larger room it was more expensive then the first night you stayed. Also you prepaid online for the first night and that makes the rate cheaper. Please feel free to give us a call if you have any other questions. We always stay here - the rooms are clean- it`s a quiet little place . The breakfast is good and they are on top of keeping it stocked up and clean. We always ask for a certain room and always get it!!! Hi, I'm happy to hear that your stay with us was enjoyable and that you enjoyed our breakfast! I am so glad we were able to get you in the room you like! We look forward to seeing you again in the future! Hotel is quite old & in seemingly bad area of town, The hotel has private security & cameras everywhere though. Most annoying was the noisy heater/AC unit. Had to turn it off overnight & the room got quite cold by morning. Brad @ checkin was great in advising where to eat based on our likesCheck in & check out was easy & quick. Hi Jerry, I'm sorry that we did not exceed your expectations, but I am excited to hear that you found our staff to be AMAZING! We strive to always provide the best service possible. Also we are in the process of replacing all of our heaters, hopefully during your next visit we will have all those heaters replaced! 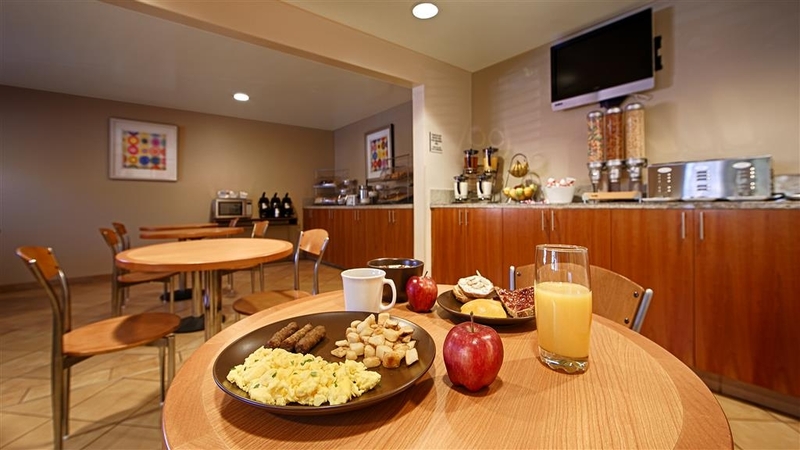 Convenient location, nice room, and great breakfast. Pool was nice and clean. Staff went above and beyond when I needed to print some documents. The Chinese restaurant next door was an excellent dinner choice. Hi, I'm happy to hear that your stay with us was enjoyable and that you enjoyed our breakfast and pool! I am especially excited to hear that you found our staff to be AMAZING! We strive to always provide the best service possible. We look forward to seeing you again in the future! "Clean room and a great breakfast"
The room was clean, the staff was polite, the breakfast was excellent, and the price was reasonable - just what I've come to expect from Best Western. The hotel room was not new or recently remodeled, but it was clean and quiet. Neither my wife nor I enjoy breakfasts that are all sugar (sweet rolls, waffles, etc.) with no protein, but at Best Western we can get eggs, bacon, sausage, etc. in addition to a variety of fruits and baked goods. This hotel provided the variety we wanted. Hi, I'm happy to hear that your stay with us was enjoyable and that are staff was friendly! I am especially excited to hear that you found our breakfast to be AMAZING! We strive to always provide the best service possible. We look forward to seeing you again in the future! I stayed here for one night for work. Check in was quick and friendly. The room was clean and had everything I needed, including a microwave and fridge. The pool looked great, but I didn't use it. The breakfast was good with hot eggs and sausage and lots of other choices. "As Expected. Great Breakfast Included." Having spent the day at the Mt. St. Helens area, this was our night time choice. It did a fine job. Updated. Clean. Good breakfast. Shower amenities (shampoo/conditioner) were nicer than many budget motels'. One note: there is NO elevator, but the highest floor is #2 so it's not like a single flight of stairs, split by a landing, is a big deal. Another note: we got the suite for our family of 6. But it offered no pullout sofa, so that was a disappointment. Based on reviews here, we chose this hotel because it was convenient to Mt. St. Helen. The lady at the front desk was absolutely wonderful! We arrived a little early and she cheerfully check us in! The room was fine, but as it is as several other Best Westerns, the bathroom sink was in the room so it's hard for one to sleep in if the other is an early riser. All in all, it was a great experience! Staff was extremely helpful. Room was clean and well laid out. facility was located close to expressway making it easy to get to and get back on road. Overall we had a great experience at this location. Hi Russell, I'm happy to hear that your stay with us was enjoyable! I am especially excited to hear that you found our staff to be AMAZING! We strive to always provide the best service possible. We look forward to seeing you again in the future! We stayed at the Aladin Inn on the way to Mt. St. Helens. Good place for the trip. The property is nice; very similar in feel to other chain hotels. It was clean and well maintained (they had actually very recently changed out the windows. Ours still had the sticker on it.). Breakfast was the usual chain hotel breakfast. It was served in a nice little breakfast area. Staff was pleasant and seemed interested in our welfare during our stay. Would stay there again. Hi Mike, I'm so glad you enjoyed your stay with us and that you found our staff to be friendly and accommodating. And yes, we are in the middle of replacing all of our windows, I do apologize for the sticker still being on your window! We look forward to your next visit to our area. "nice place for one night"
Hotel was a little hard to locate, but once I did, check in was a breeze. Clerk was very friendly and made sure there was parking close to the door I had to enter for my room. The room and bathroom were great, bed was comfortable, it was quiet even the though location seemed to be heavily traveled. I can't complain about the service or hotel itself really. I was not impressed when I pull up at first, but the once inside it was worth the one night stay. Hi Barb, I'm happy to hear that your stay with us was enjoyable and that you found our staff to be friendly and accommodating! We strive to always provide the best service possible. We appreciate your feedback and we look forward to seeing you again in the future! "A good place to stay for a great breakfast"
Best Westerns have great breakfasts in the morning and this one is no exception. The hotel staff is very friendly and helpful. The rooms are older and the beds are hard, giving you a nice back ache in the morning. The shower is very weak (low water pressure) and the drains run slow because they are clogged. This is an older hotel but offers a very comfortable stay. The room was clean, the front desk clerk was friendly and the breakfast was great. As long as you're not looking for a very modern hotel, I would recommend the BW Aladdin Inn. Hello, I'm so glad you enjoyed your stay with us and that you found our staff to be friendly and accommodating. We look forward to your next visit to our area! Absolutely fine. Nothing to complain about. Friendly staff and great bedroom and bathroom. Bedroom has a good sized fridge and microwave. Bed was very comfortable with lovely new linen. Hotel has a small indoor swimming pool. Breakfast was adequate rather than spectacular. A hot self serve buffet is difficult to keep fresh. "Great value and relatively close proximity to Mount St Helens"
We stayed one night here as we wanted to explore Mount Saint Helens. This seemed to be the closest Town that there was good accommodation. The room was clean and very comfortable. The staff were pleasant and the breakfast was better than your average hotel breakfast. The Chinese food restaurant was also quite good and well priced. I would definitely stay here again if we needed a hotel in the area. It was fairly priced and excellent value for money. We stayed here for one night on route from Newport to Seattle. The room was clean and comfortable. Noisy AC. The parking lot was being repaired and closed. This hotel does not have an elevator so if you are on the 2nd floor it means climbing stairs. Front desk staff was friendly. Good show all around. No issues and the breakfast was pretty good. Nice pool and fitness center. Friendly staff. I've had worse experiences in hotels but not not many better ones than this. Plus the Chinese place next door is pretty good. First off the positive news: they have a large dining room for breakfast and a wide variety of offerings. The staff I encountered upon check in and departure were very friendly and efficient and came up with a good restaurant recommendation that was within walking distance. Now the negative: I was upgraded to a suite and I wish I had the option to refuse. For a solo traveler it was a waste. The suites have kitchens and unfortunately the person across the hall from me cooked something that lingered in the air all night. The room I stayed in needs a makeover. It smelled musty and old and for a suite I was surprised at the size or lack of size of the bathroom. The thing that really irritated me about the suite room though was it was very difficult to watch tv laying on the bed. The tv was in the center of the room in front of a table and the bed was in the right hand corner. Therefore to watch tv you more or less had to sit at the table. Since I wasn't cooking I would have preferred a room where I could have relaxed on the bed and looked straight at the tv. I think the pricing for this hotel is reasonable and it is a great place to stop in between Seattle and Portland. "A Great Location for Exploring Mt. St. Helens"
If you want to explore the north and south side of Mt. 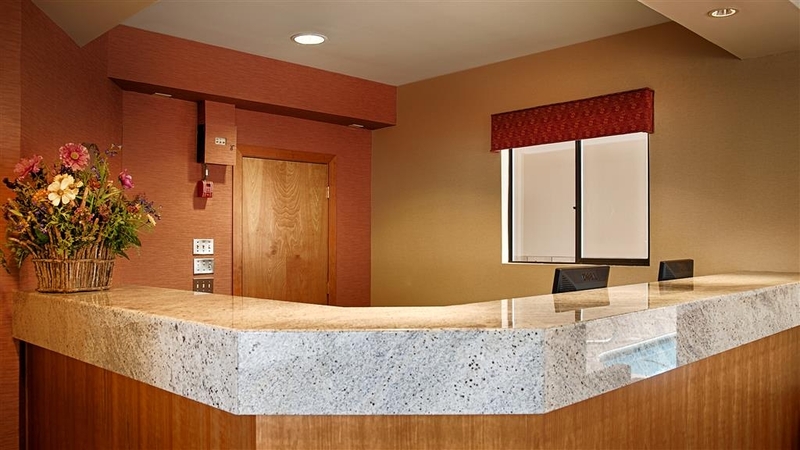 St. Helens National Volcanic Monument, the Best Western Aladdin Inn is centrally located. There are restaurants nearby and it is not far from the Interstate 5. It is a clean, comfortable property with reasonable prices, and an ample breakfast. Who knew that this little hotel in Kelso would be such a find ? Nice staff, comfortable rooms, everything well maintained, good mattresses, fluffy towels, ample breakfast, free parking, wi-fi and not expensive. Very well maintained. There is nothing to complain about here. The only downside is that if you are on the first floor, you can hear the guest's foot steps above you, so let's hope they go to bed earlier than you do! I booked a suite and it was quite large with a kitchenette, sofa, table and lots of room. In spite of being fairly close to a major street, you can avoid the traffic noise by turning on the a/c or just the fan. "Good value, comfortable stay "
We are east coasters and stopped here on our way from Mt Rainier toward Portland. Bradley at the front desk was awesome as we checked in. He got us a roll away right away even though we hadn't reserved it. Rooms were clean and comfortable. The breakfast was more than we expected - hot eggs, sausage and potatoes! Along with all the other continental style food. Was happy to fill our stomachs before setting off on another leg of our trip. 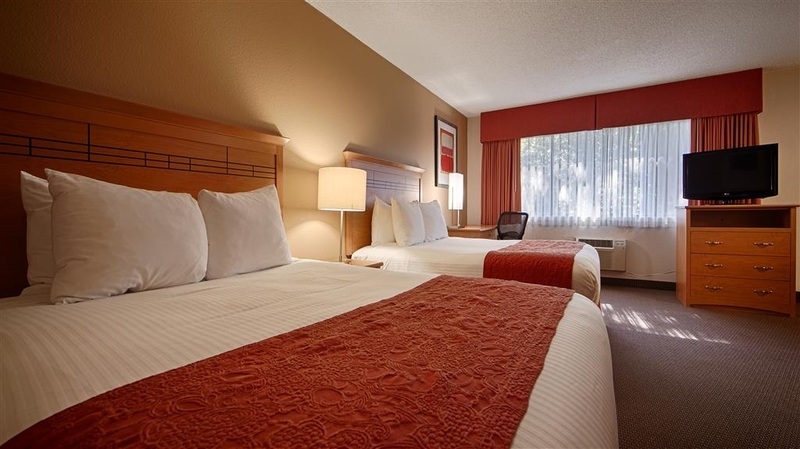 "Another Pleasant Stay at Best Western"
Best Western properties have become our go-to hotel chain to book on road trips and vacations where we want a basic, no-frills stay at a good price. The chain is ubiquitous throughout the west, and even mid-sized towns often have two or more properties to choose from. The staff at the Aladdin Inn were friendly and helpful, and they put us in an upgraded room with a small kitchenette with lots of space--perfect for our family of three. Breakfast was good, with a waffle maker, sausage, eggs, a selection of breads and pastries, oatmeal, juices, coffee/tea, dry cereal, and yogurt. Plenty to choose from, although our main complaint about the breakfasts as BW remains: everything used to server and eat it on is disposable, and there is no effort made to recycle anything. "Old building with small bathrooms"
This is an older hotel which has been completely renovated. The rooms are large and clean. However, the bathroom has only a tub and toilet and is very small. The sink is located in the main room. The staff was very friendly and accommodating. The breakfast is one of the best I've had at these type of hotels. The only reason I'm down grading this hotel from other reviews is age and bathroom size. It is a two story hotel and does NOT have an elevator. If these are not an issue for you, I highly recommend this hotel. If you need a place to stay on your Portland this Oregon this is great place. There is lots of stores around the hotel and lots of different restaurants. 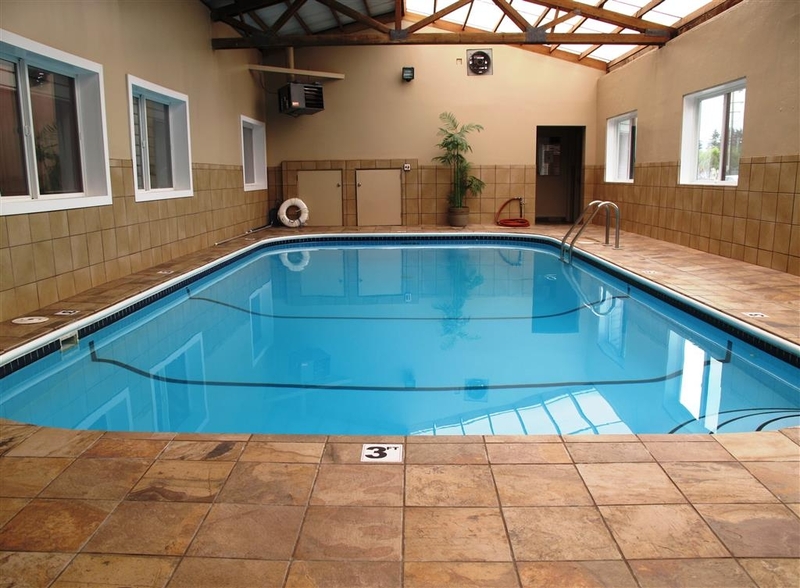 They also have a great breakfast and indoor pool. "Don't judge this book by its cover!" I reserved a room here over the Internet based on previous reviews but I must admit I was wondering about the relatively high ratings when I drove into their parking lot. The outside reflects of an older place that, I hoped, had been renovated on the inside. It turns out I was right! The front desk area was clearly redone, my room was accessed by the “modern” key card that tapped the door to unlock it. My room was clean, the usual shampoo and soaps present. The coffee pot, one of those one cup jobs, worked well. The shower head was updated and the shower curtain was clean and unstained. Breakfast was a pleasant surprise: fresh cut watermelon slices, chafing dishes contained breakfast meats, eggs and potatoes. This was the equal of much more expensive hotels where I've stayed. And, the coffee was better than expected. The owner of this place should be complimented for the detail and quality of this renovated building. I was told they were working on replacement of their HVAC system. Word has gotten out, they had no vacancies when I was there. Stay there again? Definitely, there is clearly value for the money here. Well done! "For a small town - Great Place!" We were going to be doing the St. Helens Johnston Ridge Observatory and Educational Center with a few hikes the first day and planned for the Ape Caves the second day so we were looking for a place in the middle. This was a perfect location for us. When we checked in the guy at the front desk was super kind and had a few suggestions for the Ape Caves. The room was clean and cool (it hit 102 that day). Nothing fancy, but a good size. We went down to the pool which was very clean. We all slept well. It was quiet and the beds were comfortable. The breakfast the next morning was what you would expect for a hotel breakfast (eggs, potatoes, waffles, oatmeal, breads, cereal, fresh cut watermelon, etc.) Counters and tables were very clean and an employee was constantly checking everything. When we checked out the woman at the front desk was just as friendly as the guy when we checked in! In the end, if I am ever needing to stay in Kelso again, I would stay here without a second though. Upon check-in, we were told the computer system was down so everything was done by hand. Front desk was very professional. Back parking lot is being repaired and closed so we were sent next door to the school parking lot for the night. We were at the front of the hotel, but didn't hear any street noise. Breakfast fare was average. At check out, again the staff was very professional. "Quite simply the best hotel stay ever!" This was our best hotel stay in any city ever. Everything was perfect, from the efficient check in by Tony, to the immaculate room, blazing WiFi, finished by the perfect breakfast in the morning. They even had fresh watermelon! It's easy to see why this is the number 1 ranked place on Trip Advisor, they deserve it. Looking forward to staying here again. Hi Daniel, I'm happy to hear that your stay with us was enjoyable and that you enjoyed our breakfast! I am especially excited to hear that you found our staff to be AMAZING! We strive to always provide the best service possible. We look forward to seeing you again in the future! "Clean and nothing out of the ordinary"
This place was clean and the beds were comfortable, nothing out of the ordinary. Just don't get the room by the stairwell and outside door - very noisy in the morning. The morning breakfast was nothing special. This place is not out of the way, but if you are not watching you can miss it. Parking is a bit convoluted and spread out, but it seems a quiet enough area that you don't have to worry about it. The rooms are clean and quiet. Big priorities for me. Probably put this place high on my list to stay in when I return to this area. "Good comfortable place close to town." My room was everything I expected. Ashley was a great help. I stayed here several nights because she was so kind. The breakfast was sufficient to start the day, but got boring after the 3rd day. Weights and exercise equipment lacking. This Best Western location is fine. Nothing fancy but nothing really wrong with it either. The front desk staff was great, both when I called to make my reservation and when checking in. They were friendly and knowledgeable. This is an older building and lacks an elevator. Please be aware if mobility (or just a lot of suitcases) may be an issue. The rooms were also fine. Nothing spectacular. One thing I tend to judge hotels by is their shower curtain. I know, it's silly, but I HATE it when a flimsy curtain sticks to my legs. This hotel had one of those cruddy curtains. The room had AC and it needed it the day I was there. I was quite grateful for that, it was hot! The bed was comfortable and spacious enough. Parking was a bit limited, I had to park in the very rear of the building. Breakfast was hot and fresh and there was a staff member on call if needed. She was doing a great job. "$30 pet fee is OUTRAGEOUS"
This is a decent Best Western with clean rooms and very good service. The location is so-so, the breakfast and parking are adequate. The problem is the $30 pet fee............Really? Those of you who travel with a pet understand that hotels charge $15-$20 per night for a pet. I get it. $30 is just too much. The Guest House Inn and Suites, over in the shopping center (With much better parking by the way) charges $15. The Best Western in Kelso is an average motel like many of the brand. Rooms are average size; beds are comfortable. It's a very clean place. Parking is good. The breakfast is Excellent - a full breakfast with lots of choices - yeah for oatmeal, not instant! Staff is very friendly and overall it's a good place to stay. 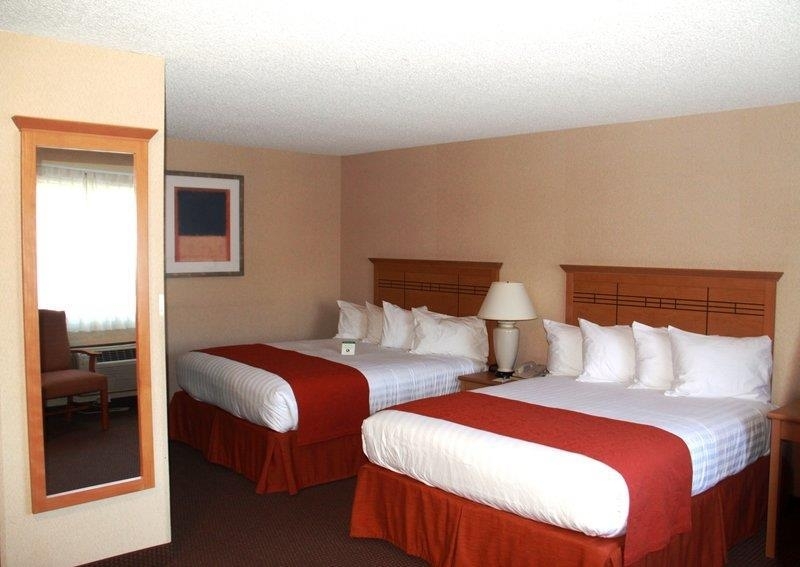 "Comfortable and easy to find off the I5"
Clean and comfortable rooms in an older Best Western. Well kept and maintained and excellent, helpful staff. Great breakfast items and choices, easy parking and easy to find. Great prices for the area and would not hesitate to stay here again. Very easy to visit Mount St Helens from here. We arrived in Kelso without a reservation for the night and thought we would get a price here. Their last room (we didn't realize Kelso was a destination location) was $93.00 for 2 adults and $30.00 for our dog!! We passed, we are taking a stand against properties that gouge travellers who travel with their dog. It is beyond me why there is a charge to begin with (extra cleaning? HAH!) as rooms should be cleaned to a high standard to begin with and not only after a dog has been in the room. If you're traveling with you pup pass on this old property and look around town. We found a great pet friendly property that didn't charge a cent for the dog. We stayed last night. It is right downtown in a cute little city. Very clean, good rate. A surprise find and I would stay again. They were redoing the windows but did not start work until about 930am. They have 4 rooms reserved for dogs. When you walk past the stairwell you get a brief smell of dog but not overpowering. Room was well lit and clean and inside and outside of hotel was clean. Staff was very kind. We ate dinner down the street at Stuffy's and it was good. We missed breakfast and I grabbed a latte at Red Leaf Coffee down the street. "Maryott at the Best Western"
Excellent employees and service. Management was well versed and rooms were tidy and neat. Would stay there again in the future. Breakfast was on time and if you need something they take care of you in a very fast fashion. Awesome breakfast. Clean and comfortable. Pool was warm and relaxing; especially for the North Western states of America's weather. Great staff. We will stay again for sure. Well worth the price of admission. Comfortable bed, lots of parking, big room. We love staying in best westerns all around and this one was no exception! Great value for the room and friendly staff that was eager to help. Would definitely recommend if staying in the Kelso area. Clean, comfortable and quiet. The room had a table and chairs and a mini fridge and microwave which I did not expect but was pleased to discover. Comfortable bed. The lighting was pleasant as opposed to blinding fluorescent. Hot good pressure shower. Good continental breakfast that was well tended. Overall good value for the price. Stayed here with my dog. Not a great area to walk your dog but good enough to take care of business. I have paid more and received less. Great place. Clean and good price. I would recommend this to anyone. The only thing is the fact that there are not many good hotels in Kelso/Longview. This is a place that I would stay again at. Friendly people. Hi Businessman2018best, I'm so glad you enjoyed your stay with us and that you found our staff to be friendly and accommodating. We look forward to your next visit to our area! "Great staff, not so great accomodations"
The staff was excellent and helpful to get us what we needed but the room was not wonderful. The room was freezing, the heat control was not able to maintain a resaonable temperature either freezing or so hot you couldnt breathe. It was a very old heating unit the kind that pulls air in from the outside. The window was not secure it did not latch or lock at all, and the screen outside was the wrong size so the security was an issue as we requested a floor level room. The toilet seat was a different size than the toilet bowl, talk about comfort this was not it. Hi, I'm so glad you enjoyed your stay with us and that you found our staff to be friendly and accommodating. But definitely do not hesitate to let us know at any time during your stay if you have any questions or concerns and we will be more than happy to assist you however we possibly can! We are in the process of replacing our heaters and we would have more than happily moved you to a different room with a better heater! We are also in the process of replacing all of our windows, so there will be no security issues. I hope that you will consider staying with us again so that we can have another chance to provide you with a superior experience. Hotel is aged, however it is an exceptional value for the cost. rooms are clean, they use modern bed covers that get washed with every new customer, unlike other hotels that have traditional bed spreads that don't get washed often. not a 4-star hotel, but excellent for a place to sleep comfortably and great shower in a clean room. great A/C and heater controls. Pick a room on the upper floor if possible. breakfast is typical continental, and not the best, however we didn't chose the hotel for its breakfast. water pressure was awesome and great shower. this place is better than other more expensive hotels in the area. Hi Robert, Thank you so much for your nice comments about our hotel. We strive to make every guest's stay an enjoyable one! I'm sorry that our full hot breakfast did not impress you, but I'm glad succeeded in making your stay an excellent one overall! We look forward to seeing you again in the future! No internet service in room for the second time we stayed at this Best Western. Room had serious musty odor smell. We will never use this Best western again. The location is not convenient to the freeway and the manager on duty did not even try to get the internet service working. Hi Wayne, Thank you for taking the time to share with us again about your recent experience at our property. I again would like to apologize for the issues you experienced during your stay and hope that you will consider what was discussed in the email you received from us and give us another chance to provide you with a superior experience. We are unaware of any widespread internet issues in the hotel, but I'm so very sorry that the employee working the night you were here did not try to help walk you through some troubleshooting with your device. I am also sorry to hear you felt the room had a musty odor to it. I have made a note for housekeeping to check that out in the room you were in tomorrow. I hope you had a wonderful visit to the area and a safe trip back home. We sincerely hope you will give us another chance the next time your travels bring your through town. A bit out of the way of the I5 - we still were awoken by the nearby train running several times a night. The hotel chairs were old, worn and very uncomfortable. The staff were nice and accommodating. The breakfast was on time and good. Would like to see milk put out as an alternative to 1/2 and 1/2 for coffee. Rooms are tired and really need updating. Hello! I'm sorry to hear that you had some problems with your stay, but I'm glad it was an overall enjoyable time and especially that our staff was so welcoming for you! We are about 1 1/2 miles from I-5, but being in the neighborhood that we're in, we do generally get a bit less street noise. I'm certainly very sorry, however, that you were awoken by the train several times! I also am sorry that you didn't think we had milk available for your coffee. In addition to half and half and flavored creamer, we do have milk located in the refrigerator on the counter. Definitely do not hesitate to let us know if you have any questions; we are here for you 24 hours a day! We look forward to seeing you again soon! Thank you so much for your review of our hotel! I'm glad you found our location convenient to LCC. At just about a straight shot mile away, we are one of the closest hotels to the college and get quite a few people coming to stay with us for that easy access! I hope you had a nice visit to our little town and a safe trip back home to Idaho! We look forward to seeing you again. "Look for another Hotel in Kelso"
I would not recommend this hotel to stay to anybody. desk clerk would offer no discount and had no interest in accommodating us for an overnight stay. After nearly walking out and looking for another Hotel in the area after mentioning I'm a Best Western member and AAA and having a seniors card he gave a slight discount. I've crossed this Hotel off breakfast was the highlight of the stay. Hi James, I'm happy to hear you enjoyed our awesome breakfast, but we again apologize for the experience you had here at our hotel. Our AAA rate is the standard 10% off, like most hotels. However, you must pay for the AAA membership, have proof of membership upon check-in and let us know at check-in, to receive this discount or any other discount you may qualify for. I do apologize for any confusion this may have caused. As a Best Western Rewards Platinum Elite member, we do value and appreciate your business. On your next trip through town, please let us know of your AAA membership so we can offer this rate to you right off the bat to avoid any hassle. We will, of course, also be sure to get you your elite member upgrade to our best available room. I hope you had a wonderful visit to the states and a safe trip back home. Older motel but kept up to date and managed well. Parking area was well lighted and maintained daily. Located in an area that was close to good shopping and places to eat. This stay was a good experience. Thank you for your response. We do value your feedback. Glad to hear your stay with us was good and we hope to see you on your next visit through our town. Needs to be remodeled. The overall feel of the hotel is dingy and dark. Old smell and uncomfortable. Longview needs some new hotel options, I will not be staying here again. Will stay in Vancouver and drive up. Thank you for taking the time to share about your recent stay with us, I'm happy to see that you were impressed with the service you received during your stay, but I'm so sorry to hear that you were so dissatisfied by the hotel and your overall stay. We are always looking at ways to spruce up the place, and most recently replaced the carpeting in all of our hallways! We are really happy with how it turned out, and hope to continue making awesome improvements over the next year. We know you have options when choosing your lodging needs, but we hope that you will give us another chance the next time your travels bring you to our area you will think of our wonderful location and give us another chance to provide you with a fantastic experience! Dilapidated motel, broken toilet, loose bathroom tiles, squeaky bed, mediocre breakfast. Parking was very strange too. Front desk clerk refused to give me a receipt which was needed for work purposes. Very rude staff. Hi Greg, I'm very sorry to hear that your stay with us was anything less than wonderful. Definitely do not hesitate to let us know at any time during your stay if you have any questions or concerns regarding your room or your stay and we will be more than happy to assist you however we possibly can, and I'm very sorry to hear that our array of pastry items, hot and cold cereal, yogurt, fruits, waffles, sausage, hashbrowns and eggs were not to your liking. I believe I was able to find your reservation and have already made a note for maintenance about the issues with the bathroom. As far as not being given a receipt, the desk clerk explained to you that she was unable to give you one because you already got one from Expedia when you made the reservation. The payment information Expedia gives us about your reservation is not the same information that you have, so if she had given you a receipt the information would not have been correct. I do apologize if this was not explained clearly enough for you at the time of your check out. Know that we will be happy to match any rate you see online, and if you book directly with us we will always be able to provide you with a receipt at check out. I hope that you will give us another chance on your next trip through town. I have stayed at Best Western hotels as much as possible. They are always clean, friendly, and comfortable beds. The breakfasts are always good and enough food to start the day. This hotel was all of that. I was on a 3 week traveling trip with friends 1 night at a time. Restful sleeping at night, early departure, and on to the next stop. Enjoyable stay. Thank you for completing the survey regarding your recent stay at our property. We value your opinion. So glad to hear your stay was a pleasant one and we look forward to seeing you on your next visit. If I can provide any assistance, please don't hesitate to contact me directly at 360.425.9660. Stayed for over a month and find the room to be comfortable and roomy. Staff was very friendly and accomedating. The hotel is in a convienent location for dining options. 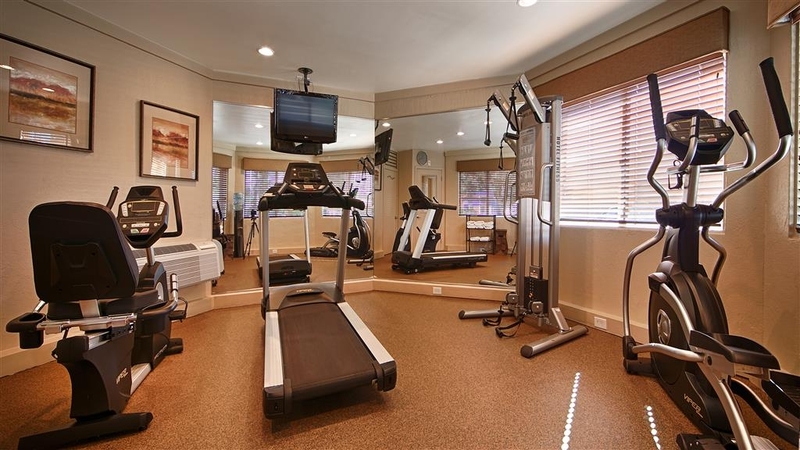 Fitness is satisfactory, but the hotel does have a nice indoor pool. Thank you for completing the survey regarding your recent stay at our property. On behalf of our entire team, I would like to apologize for not exceeding your expectations. Your satisfaction is important to us and we will be using the feedback you gave us to implement improvements to ensure we offer a better experience for guests in the future. I hope that you will consider staying with us again so that we can have another chance to provide you with a superior experience. If I can provide any assistance, please don't hesitate to contact me directly at 360.425.9660. Front desk staff is amazing and I can't say enough about Tony! But, the bed was horrible and housekeeping overlooked us the 2nd day. Thankfully, Tony came to rescue and brought us up some clean towels. The rooms were substandard and the shower curtain was mounted waaaay too far into the shower. I felt violated by the curtain! Smirk. I would not recommend this hotel to my friends and family. "Great hotel for the money "
This hotel is located right in the middle of Kelso. It is within walking distance of an excellent steakhouse. The room here was very quiet and the bed very comfortable. While I think the hotel is a little on the expensive side I would recommend it if you need a clean room for the evening. Our bed and shower were both excellent. The breakfast was complete and well laid out. There is a beautiful park close by, that was a great place to walk and unwind. Nice friendly staff, they were very helpful. Old hotel, in rough part of town, homeless roaming around the parking lot, breakfast was poor, hotel had a smell to it. Rooms are redone somewhat you can tell they tried to give it a face lift. beds were decent. No good restaurants near by. No water in rooms. might want to try the Red Lion instead. We stayed at the Aladdin while on a road trip. The suite we had was very large complete with a kitchenette. It does not have a hot tub, which would have been nice. Breakfast was good. Hotel needs some updating, but otherwise-good stay. Thank you for your response and feedback. We do appreciate any tips received to improve our service. We look forward to your next stay with us. "Sleeping in my car would have been better"
What a dumpy hotel room. It was TINY, bathroom had black hairs on the floor - both long hairs from the head and other "curly" ones. The sink was in the main room. The floor on the side of the bed near the windows had a broken sub floor - you could feel it flex when stepping on it - in multiple places. The lack of sound proofing of the rooms was insulting. The people above us paced in their room until about 3:30am. The man next to us sounded like he was in our room (it was a room with an adjoining door). I heard every cough, snore, and I swear I could hear him roll over in bed. I refused to shower there because I wanted to out ASAP. I rated them a 2* because the free breakfast was actually good, and the lady stocking the food was nice. "A little outdated - but clean and comfortable." We stayed for 1 night on our way. The room was clean and comfortable but could use some updating. For a 1 nighter, this motel was great. The breakfast the great. Lots of options - fresh fruit, eggs, sausage and waffles. Better than some restaurants. Thank you for your response and feedback. We look forward to seeing on your next visit. A nice place to stay in a very busy and otherwise nondescript area. 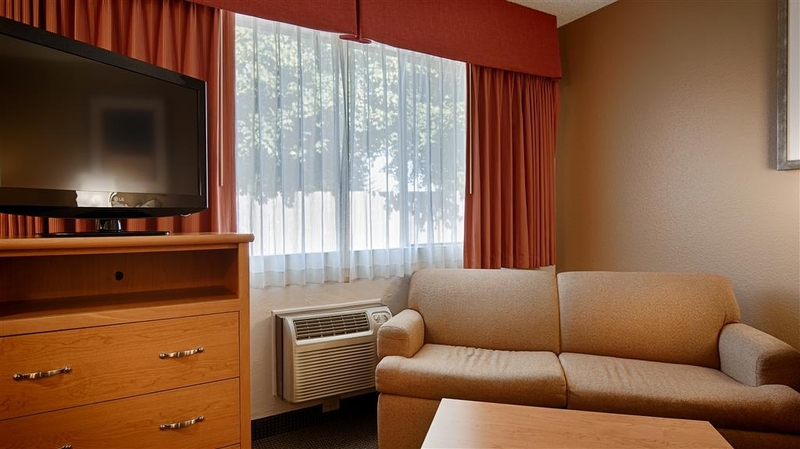 A typical best western with quality amenities and friendly staff. The girl at the desk had us checked in and ready in under 15 minutes. The Hotel was very clean , carpets were new and so was the warming pans in the breakfast area. The staff was friendly and the breakfast area was well stocked and very clean. Aurora keeps the area very picked up and food constantly filled up in the trays. She is very personable to the customers. Thank you for your response and feedback, Aurora is a champion. We look forward to seeing you on your next visit. The price was right, it was clean and comfortable. Hotel staff was pleasant. Breakfast was pretty good. Location is in town, easy access to everything we needed. Air conditioner took a long time to cool the room off though. Thank you for your response and feedback. We look forward to seeing you on your next visit. Great breakfast!- Muffins, cereals, oatmeal with many toppings, scrambled eggs and egg white patties, hash browns, link and round sausages, bages, English muffins, cheese (for a nice breakfast sandwich), fruit, coffee and juices. Clean, the tooms could be a bit larger and we find both the bed too soft and the pillows too large to be comfortable. Shampoo, but no conditioner or lotion. Good location, very friendly staff. Thank you for your response. So glad to hear you enjoyed our breakfast. We look forward to seeing you again on a future visit. Excellent place to stay. Clean and well maintained. Friendly staff but parking was limited if you get in late. Breakfast was good but seating was crowded. Didn't use the pool or gym but it looked like it would be fun. Well worth the price paid. "NICE BIG ROOMS VERY CLEAN"
The hotel is older but well kept. It looks like some of the rooms are being renovated. It was clean in a good location to I5. The staff was great to deal with. The breakfast was ok with the usual stuff. The rooms are clean, beds are comfortable, staff was very nice, breakfast was good had a lot of choices but was the same everyday. Good location to anywhere you want to go in the area. Recommended !!! Thank you for your review of our hotel! We very much appreciate your positive review since these reviews are critical to the success of any business these days. Please know that we are always trying to improve breakfast selections and provide a variety of items that people will enjoy and will continue to make improvements wherever possible. We hope you'll stop by again next time your in the area. Have a great weekend! "Not a bad place to stay for the night"
I recently had a good experience staying at the Aladdin in Kelso. It was just for one night, and the staff was helpful and courteous. The overall appearance of the hotel from the outside is a bit old, and not what I'm used to with Best Western, but overall once inside, it was a pleasant stay and accommodations were good. There were plenty of choices for dining close by, and the breakfast in the morning at the hotel was very good! Thank you for your feedback and we look forward to seeing you in the future. Stayed here for 1 night while traveling through the area. Room was clean, beds were good, bathroom a bit small, but functional, wifi was good and plenty of parking. It was a short drive to the center of town with an assortment of restaurants available there. Breakfast had a nice selection of food/ beverages although the breakfast room was small so getting a table to sit was a hit/miss thing. This hotel does not have an elevator so if you are on the 2nd floor it means climbing stairs. However, for a 1 night stay and the price paid, it was a good experience and I would return there again. Thank you for response and we appreciate all feedback given to us to help improve the stay of our guest. Good facility close to river and downtown, Parking is a little tight, but made it OK. Breakfast was hot and tasty. No real complaints. Good access to local businesses , internet was handy and fast enough for what we needed. Thank you for your response and we look forward to your stay with Best Western. Excellent customer service, great motel on the Rider rewards program. Used the motel as a base for our motor cycle tour of Northern Oregon, and the coast. The pool was a great addition after a days ride. The morning breakfast was superb, every thing was hot and fresh. Thank you for your response and for choosing our hotel for your base. We look forward to seeing you again in the future. We checked into the hotel at 11:00pm and the staff were very friendly. Although the hotel is older the rooms and hotel are maintained and clean. We didn't use the pool but it looked bright and clean also. Breakfast was good with a variety of food. We enjoyed the hotel for 1 night. There are absolutely nice place to stay. We used two queen beds room. The room was nice and clean. The beds are comfortable, the pillows are fluffy enough. The bathroom was clean. You can enjoy the swimming pool in the hotel. The hotel close to restaurants. 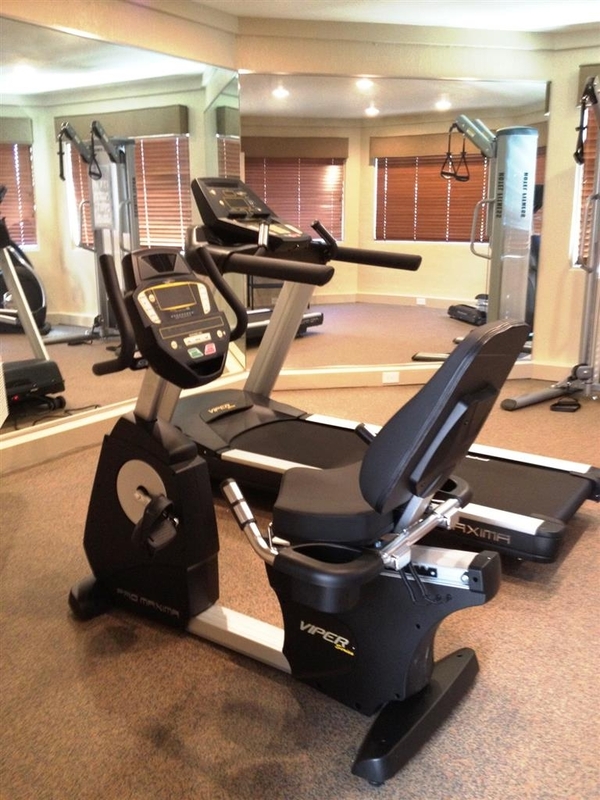 Excellent Hotel great Bed, very good shower and good fitness equipment. Would recommend this hotel and will come back again. Could be in a better part of town, but the facilities were great and the staff very helpful. This hotel is a great hotel to stay st. It is close to Mt. Saint Helens. The room I stayed in was very clean and had a great kitchenette. The staff was helpful printing out directions for my trip. I would stay here again for both business and pleasure. "Had a great stay, but was double charged"
Rooms with 2 queen beds for a family staying multiple days kind of small but amenities were good. Beds too firm and uncomfortable. Very nice pool and clean. Breakfast options are great but not enough seating for families. Considering other hotels in area that I saw and heard of from friends and family this is a great choice. Stayed here for a few nights while exploring Mt. St. Helens. When we checked in we were told that we were being upgraded. What a nice surprise! We had a huge room with a kitchen where we happily cooked our dinners. Housekeeping was exceptional. Breakfast was good with plenty of nice choices. Only quibble: people came into the breakfast room in bare feet, really gross, it's not their house. I mentioned this to the front desk clerk who said what do you want me to do? Suggestion to management: post a sign outside the bfast room requesting that guests have shoes on. We chose this Best Western because of the reviews. It turned out to be a good choice. It was clean with comfortable beds, flat screen TV, and good wifi. There are restaurants nearby. We tried the pool and work out areas, and they were in nice shape, also. Breakfast was well tended with hot foods available. The only odd thing about this place is the parking. It's goes one way around the shape of the hotel. We'd go back to this hotel again. Have stayed here many times on trips from home to see family in the PNW. Gets you past Portland congestion and is a straight shot to Seattle. Full breakfast, comfortable bed, and mostly quiet at night. After I had made a mistake booking my room, operator error, I found I had booked it in the wrong month! We received the bill and discovered my mistake! Well Brittany(?) Talked to the GM and the owners and they comped our room for the night that I had screwed up! I did not expect that as it was my error, but they did! It was a fantastic visit! The hotel is nice, quiet, there was a little league tournament going on that weekend, but you would have not known! So to all that fixed my mistake thank you, we will be back! My family and I stayed here for 3 months while I was doing business. We stayed in a room with a kitchenette. It was perfect for our family of 5. Most of the staff was great. Pool is nice and big. breakfast is good. Brittney the manager is great. The only down falls are, I do wish there were more than 1 washer and dryer and our room looked out to a drug house. We would stay here again. Inexpensive too!! Older hotel but kept up nicely. I was on the bottom floor so of course I heard the room above me. Location made it easy to go to many locations. Even with a kids baseball tournament going on things were quiet. Didn't even realize they were there. Great hotel. Close to a downtown area but not many attractions near by. Good for passing by or visiting family in the area. Not on the highway maybe under 5 miles away. Parking is scarce but free. Quality is great. Breakfast above average. This was a great place for a quick overnight stay. The rooms were extremely clean as was the entire hotel. The staff is friendly and the breakfast was definitely adequate. Would not hesitate to stop here again. "Nice property for an overnight in the area"
I stayed here with my hubby while he was at a conference. The room was clean and had no odors. This is a pet friendly hotel but the rooms are designated so no funky pet smells in ours. The complimentary breakfast was scrambled eggs sausage patties and hash browns (which needed longer cook time). There was also fruit and yogurts with pastries and breads and assorted cereals and juices. The staff made the stay incredible. We left our pet with my daughter at the last minute so we needed to change out of our room and the front desk girl was great about it. For a moderately priced room it was well worth it. The Office restaurant is just down the street and should not be missed. Fondue for miles!!! The staff was very friendly and helpful. When I first walked in, I was skeptical because the lobby screen window was bent and it had an old odor throughout. The carpets could be replaced and a little attention to details that you get with big hotel chains. But my room was great! Spacious and clean the bed was comfortable and I slept all night! The breakfast was perfect for me. there was a lady in there cleaning and refilling food all morning. I would absolutely stay here again. I have stayed here 5 times in the past few months. I always have a perfectly clean room, the staff have provided everything that I have needed, and I have been able to check in early when needed. Breakfasts are great, also! I plan to continue to stay here whenever I am in town! "Great sleeping experience. 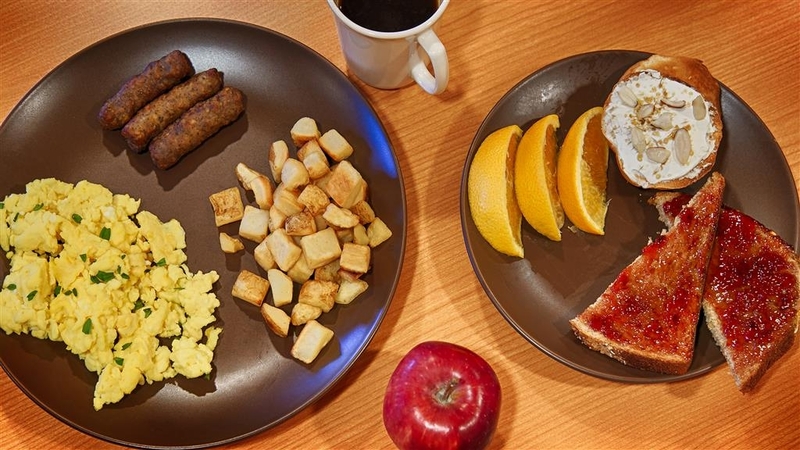 The best breakfast choices compared to many other hotels." This is not a fancy place and there could be newer carpets on stairs and floors in hallways . The location is easy to find and not scenic but we just needed a bed for the night and slept very well. Bedding and bath linens were fine. "BW Aladdin, Kelso, perfect for Mt St Helens"
Hotel is great location for visiting Mt St Helens. Very close to 3 Rivers Mall with plenty of restaurants and shopping. Quiet room, clean, plain and functional. Indoor heated pool. Staff is great and helpful! just a little note check your breakfast before serving, during our stay there was a hair in the scramble eggs, I guess this could happen at any restaurant as well but just a heads up. overall the stay was ok, the beds are not very comfortable, but for the price it could have been worse. Stopped overnight in Kelso on our travels home. Friendly helpful staff, the comfortable, quiet room and a good selection of items at breakfast made the BW Aladdin a good choice. We would recommend the hotel to friends. We had a group of people staying at the hotel and the staff was very accommodating and helpful. Went out of their way to make us feel welcome. The pool was a welcome activity and right by the front door of the hotel. Breakfast was hot and they kept up with the large number of people being served. The most important thing to us when we travel is a comfortable bed. The beds were so comfortable! The breakfast was ok - fair selection and hot. The staff were really friendly and helpful. Good distance to amenities. We spent one night. Reception was helfull, nice, etc. The room was large and clean. Bed and linen were comfy and soft. Nothing bad to say. 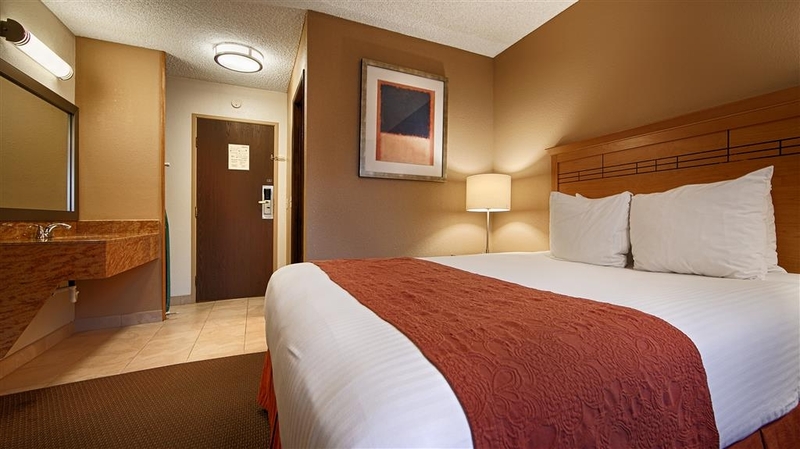 Perfect for a night or more... Best Western is always a good choice when you are on the road. This Best Western was friendly and excellent for families I noticed. The rooms were clean pool was being used. Breakfast was well looked after. All the staff were verse helpful with anything you needed assistance with. Stayed six night why here on work! Stayed at other hotels in this area this one is one of the best. It is a but has been kept up! Very clean and very friendly staff. I would have no problem staying here again! "Take a lever to force shower on"
Shower needs excessive force like it's about to break. Breakfast was very poor compared to other best westerns. It seems like a local business hotel and not one for tourists. Not a place to stay if going to mount saint Helens. The sheets didn't fit the bed so expect to be uncomfortable when you wake up. Lovely pet friendly room even provided bowl, mat and treats. Helpful staff, excellent full healthy breakfast. We enjoyed a lovely meal close by and a restful sleep in a very quiet, comfortable spacious rooms. This is a very nice hotel with an attentive, helpful staff. Our room was neat, clean and spacious. The breakfast was dependably delicious, complete with two varieties of hot eggs and two varieties of sausage plus home fried potatoes daily. The breakfast room was large and particularly well-cared for, offering a very wide variety of other foods, including waffles, cereals, fruit, yogurt, pastries, and beverages. The staff were very good, helpful and courteous. The breakfast was very good. The hotel is dated it needs remodeling and updating. The room was provided with everything needed. The cleanliness of the room was so so. The bed was hard and uncomfortable. This hotel is always very neat and clean when ever I stay here, which is often. The staff is very friendly and knowledgeable about the local events going on and what activities are happening. If you have a question they are ready to help you in any way. The breakfast room is always neat and clean plus always is stocked with all kinds of goodies to eat. Need I say more. I will be back again next month.!! "A GREAT hotel with wonderful staff"
The hotel has wonderful rooms with a full kitchen making it perfect for an extended stay. The breakfast is over the top for the price range this place offers and makes my stay here soooooo wonderful! The full refrigerator, microwave, tons of other items to include plates and bowls, just makes this a nice 'home away from home'. It was great. We needed a place to stay for the tournament and I chose here because of the reviews. We were not disappointed with the stay. Kids enjoyed the pool and breakfast was good. Lots of other kids though and parents let them run around the hotel. That was the only thing I didn't appreciate however disrespectful kids aren't the hotels fault. Hello, Thank you for taking the time to write a review about our hotel, but I'm very sorry to hear that we weren't able to exceed your expectations! While we do offer cold cereals, oatmeal, sausage, hashbrowns, eggs, yogurt, fresh fruit, waffles, and a large variety of baked goods, I'm very sorry you couldn't find something to satisfy your palate. We strive to make every guest experience a fully enjoyable one though, so please do not hesitate to make a suggestion for an additional item you would like to see on the menu! We are always growing and always listening to guests to find out how we can improve in the future. 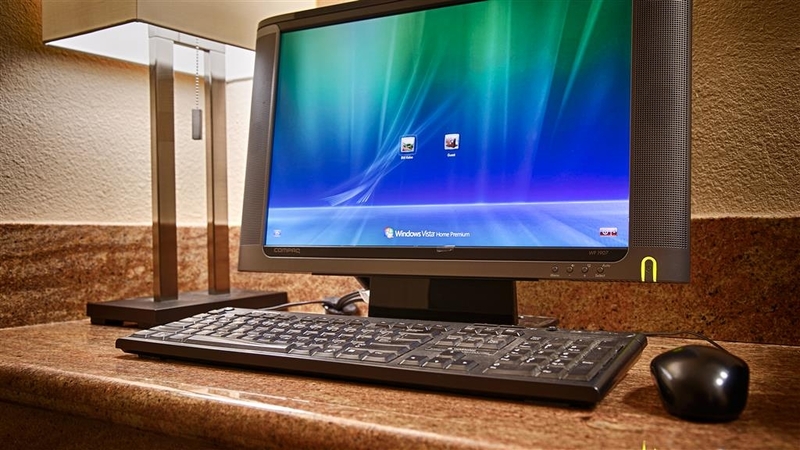 We have gone through much updating over the past few years, and some of those updates did include some USB plugs in our Kitchenette Suites - these rooms are quite spacious and one-of-a-kind for the area! We invite you to check one out the next time your travels bring you through town! I understand your concern regarding security. Know that we do have cameras recording all parts of the parking lot and inside public areas, as well as a 24 hour front desk monitoring these cameras and security driving around during the night. Please do not hesitate to let us know at any time during your stay if you have any concerns. Finally, as far as the parking situation, that is something we are working on. Perhaps our plans will have come to fruition before your next visit to the beautiful Pacific Northwest! Nice place, one semi-irritable staff member. In all, definitely recommended. Good location and a very good quality (for the price) breakfast. My room was "like new" and clean and quiet. I can't comment on other Kelso hotels but this one is excellent. Hello Allan, Thank you for telling us about your time here at our hotel. I'm again very sorry about the issues you experienced, but I do hope the email we sent in response to your survey helped explain your situation a little better. That said, I'm thrilled to hear that you had an otherwise excellent stay! We know you have options when choosing your lodging needs, and we thank you, that as a Best Western Rewards member, you chose to stay with us. We look forward to seeing you again the next time your travels bring you to the area! "Good choice for the location"
Good Best Western value, great breakfast, comfortable room, very helpful and friendly staff, the best choice for the location, convenient to the Mt St Helens area, access to the coast and the highways. Hi Donald, Thank you so much for taking the time to tell others about your experiences here at our hotel. I'm sorry that we did not exceed your expectations, but I'm so glad to hear that you had a satisfying stay with us. We are the closest Best Western to Mount St Helens' crater, and we get quite a few Mountain visitors passing through the area! I hope you had a wonderful visit, as it can be quite a magical experience. We again thank you for choosing to stay with us, and we hope to see you again on your next trip to the beautiful Pacific Northwest! Kelso is not the "garden" spot of the state, but if you're traveling north or south on Interstate 5 for some reason you might need a hotel in this area. This hotel is fine, certainly nothing special, but adequate. I wouldn't suggest walking the area, About a 5 minute drive away is a Sizzler restaurant that we found to have excellent food. "Whew!! A Port in a Storm"
We're on the way home from Sacramento. With 120 miles left to go, the sky opened up, and all the animals were lining up, two-by-two. Well, I can take a hint. So, we scooted into Longview for some dinner, and I called the Aladdin. With the rain that was coming down, getting close to dark, and one dead headlight, I didn't think driving the rest of the way home was a brilliant idea. Got a room reserved, and 30 minutes later, I'm in it writing this. I picked Aladdin cuz we've been here before, and know it to be a nice place. Happy to see nothing's changed. My husband and I stayed at this Best Western on our way out of Mt. St. Helen. It's a bit off the highway, but no problem to find with a gps. We did not have a reservation, and the night manager was excellent in giving us an "online" best rate (lower than the rate quoted by BW general reservation number). The room was clean, bed comfortable and breakfast excellent - scrambled eggs, sausage, hash browns, real granola, and the other usual fare. There is a very nice indoor pool. "One you can count on"
Always a pleasure to stay in a place that has consistency, great breakfast to start the day. Would recommend to close or new person. On our trip across the west coast or inland Best Western works for us. "One-night stay in Kelso for Scottish Festival"
This is a nicely kept facility with a very nice breakfast and comfortable room; well-lighted parking, ample spaces, handy entrances/exits to rooms. For those who like swimming, there is a very nice pool right off the lobby, although we did not use that ourselves. A nice ramp into lobby for those needing handicap accessible facility. Although I felt the bed was comfortable, my wife did not think it was. But the room appeared to be adequately clean. We stayed here over labour day long weekend for 2 nights. Pros: -Easy to find off the I-5. It didn't take long to navigate the area. 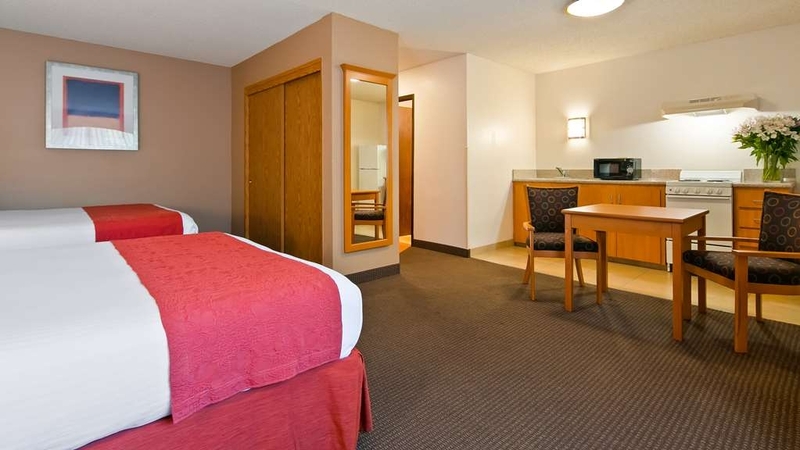 -Rooms were somewhat updated and linens were clean and fresh and beds were comfortable. -Continental breakfast included. Decent food items as well. Eggs, hashbrowns, sausage and fresh fruit were some of the options. -Staff was friendly and courteous. Cons: -Building has been rehabbed, but it's still old so the hallways and stairwells smelled musty. Rather unpleasant. Ashtray and smoking area is located immediately outside of the side door. I also found that to be distasteful. -I found that it was quite loud. Everything from hearing the neighbouring guest's shower running to cars driving by outside to doors opening and closing in the hallways. It was rather disruptive especially when I was just nodding off. All in all, it was an average accommodation that fulfilled a need. I usually look for Best Western's because I know that they are a reputable chain, but I would likely consider staying elsewhere if I was in the area again. "Passable for a short stay"
We were looking for an inexpensive place to overnight to break a long journey, and chose this member of the Best Western chain based on its location and the fact that it is part of a well known brand. The reviews at the time were mixed, but had enough good ones that I thought it would be a safe bet. When we arrived, we noticed right away that the building is a little more run down than the photos suggest, but the reviews mentioned that there was some updating going on, so we didn't worry about it too much. When we checked in and got our key cards, we went along to our room, and when we opened the door, we were surprised to find someone else's luggage in the room! We went back to the front desk and explained what happened, and the desk clerk seemed very surprised, as the computer showed that the guest had checked out...hmmmm. We were given another room, but it made us rather nervous, since there didn't seem to be any explanation as to how this happened, and we wondered whether someone might be able to access our room because of the same mistake...hmmmmm We went for dinner to a restaurant that was suggested by another staff member, which turned out to be a great place, and lots of fun. We came back, planning on an early night so that we could get an early start in the morning. As we spent more time in the room, it became very apparent just how thin the walls and floors are, and how much noise passed between them from other guests. The people above us sounded like the were re-arranging the furniture every 30 minutes or so, and we could hear most of the conversation going on next door. I realize that this building is old, but, really, Best Western shouldn't be hanging its name on this kind of place without a complete renovation. The carpets were old and needed replacing, and the fixtures were all pretty tired as well. To be fair, I think the beds in our room had been replaced, and were quite new and very comfortable. Thankfully, all the travellers above and around us were pretty quiet by around 10:30 or so, and we actually had a very good night's sleep, but I shudder to think what might have happened if there had been active children, or people who wanted to party a little - it would have been impossible to sleep. Breakfast was, in a word, disappointing. I wasn't really expecting much, because the price point of this motel is relatively low, but the eggs were pretty tasteless, the sausages greasy, the fruit salad was mostly melon, had already run out, and was not replenished. There were three cereals on offer, but little else, and the bread/bagel/muffin choices were not very nice quality. The best thing they had was the waffle maker, which turned out very nice waffles. The staff, apart from the room mixup, was pleasant and the rooms were clean, but I wouldn't stay here again, because it's just too noisy. Really nice place with big & clean and big rooms. Check In was quick and really friendly. There is also an indoor pool (which I didn't visit). Parking around the building is free. Breakfast is basic and OK. I shall be back. 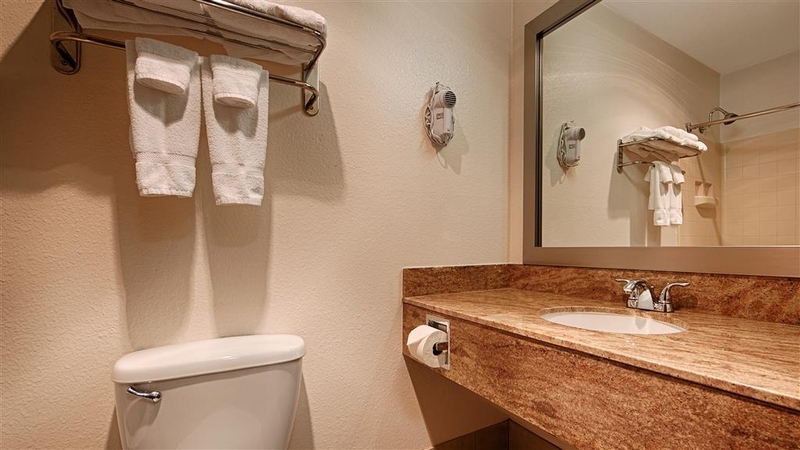 It is unusual when a hotel has a perfect score on annoying items such as AC, lavatory drain, bathtub drain, shower head, door latches, lights, TV etc. This place was perfect in that respect. Amenities excellent. Flaws: breakfast room was a little small in view of the high occupancy. Very clean facility and comfortable room. Competitively priced. Great breakfast. Staff very friendly/helpful and professional. Great stay. Enjoyed my stay...the area is also very quiet/relaxing. 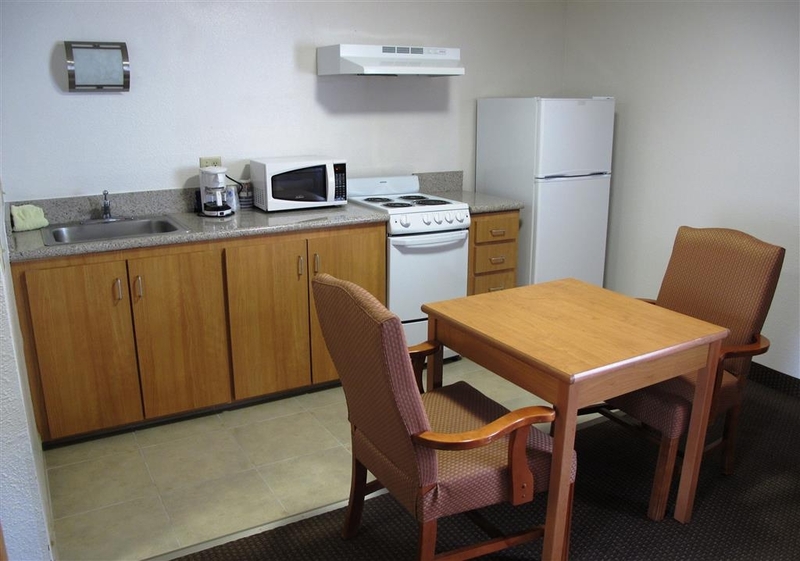 Hotel in walking distance to various businesses/restaurants. Excellent restful nights. My family and I will definitely stay there again. My family and I will definitely recommend this hotel to all our family and friends. We loved our stay in Washington State. The weather was nice and the sights were very pretty. If we can stay at Best Western we do. This stay started out pretty good, Franklin was so helpful when we got there. He put us in a pet room but it was right under the stairs so I asked to be moved, so he called his manager and he put us into another room. UGH!!! This room is supposed to be form the disabled. We were so disappointed in this room. When we took a shower there was water running out of the bathroom into the main room almost into the main hall way of the motel. The shower curtain didn't hang over the shower stall like it should ( see pictures). When my husband pointed this out to the manager that was on duty she informed him she knew that there was something wrong but it is what it is. Nothing could be done about it. When I tried to show her pictures of it she snapped at me and said "I know all about it HE ALREADY TOLD ME WHAT'S WRONG"! I informed I would be sending a review to trip advisor and she said of course and it's all my fault. I said no you just need to get someone to fix it. 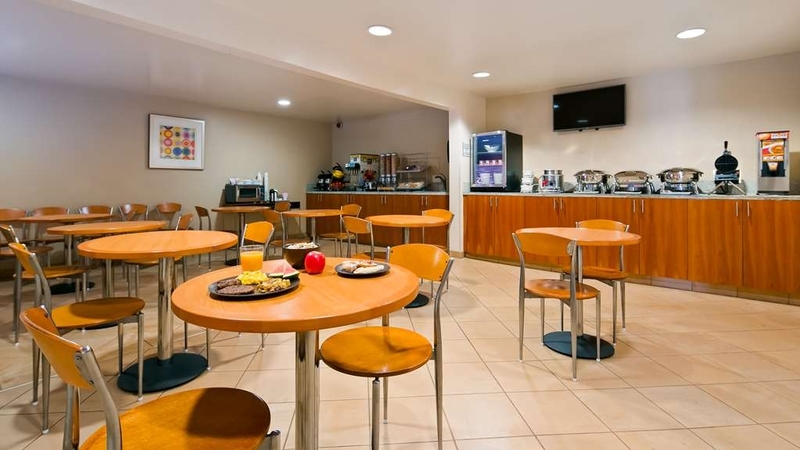 "Small but efficient with amenities- wifi, indoor pool, breakfast items and variety were excellent"
Although the room is smaller compared to other Best Western or other hotels, it is ok for a one night stay. There is no sink in the bathroom and no table to eat but again, the room is clean. I always love the pillows and comforters! Breakfast starts at 6 which is unusual for some hotels, but it is great that breakfast starts early. Food variety and quality is excellent in this Best Western hotel. "Not excited about this hotel"
Looks outdated on the outside and in the hallway. Room was more updated and comfortable enough. Bathroom just okay. Breakfast okay. Staff could not find my daughter's most prized stuffed bear that was left there. Though they were polite about it, it didn't seem that they understood the importance of it. I do not understand how it could not be found when we know for certain it was left there. Disappointed. Our stay at The Best Western (Aladdin) was quite nice. We felt the staff was helpful. The pool provided entertainment my nephews. The food was plentiful, but we didn't care for the potatoes or eggs. The eggs and potatoes were bland, but that was probably do to no salt for a reason. Salting after cooking doesn't taste as good whennot salted during cooking. I understand some people cannot have salt. We really liked all the staff, Our thanks to all the staff for doing a good job. "Not. Worth. The. Money. " Check in is fast. The front desk staff is very helpful. The breakfast is good. The room is clean. The swimming pool is a bit small but clean and it was not crowd on my stay. The bed is a bit soft but may be only my personal preference. This hotel is old and desperately in need of upgrades. Our room had a small kitchen area, but everything was very outdated. The room also had a horrible odor. In fact, the entire hotel had an awful smell. Had we not been exhausted from just getting off a plane, we wouldn't have stayed. We couldn't get out of there fast enough. The room was clean! The hotel hallways, etc were clean. The breakfast in the morning was a nice touch and very good. The front deskman was very helpful and friendly. It was nice to have access to a washer and dryer after we had been cycling from Canada. typical BW hotel...breakfast was sparse but what you would expect. Have trouble with their reward program, sometimes have to phone their hidden number to ensure points are rewarded. they advertise biker friendly but no evidence they treat bikers any different, no special service or parking stalls. This Best Western was a great surprise. The desk clerk was efficient and competent. She helped find a great restaurant to have dinner in the area. The room was clean and so was the bathroom. Very satisfied with this hotel. "Best Western Kelso clean and convenient"
The room was clean and the beds were nice. Breakfast was good. Only negative is that there isn't an elevator so you have to carry your luggage up to the 2nd floor. Also, the windows rattled when you walked across the floor. Hotel is convenient if you're going to Mt. St. Helens. "Nice friendly staff. Super clean rooms and right off the freeway." Staff were very nice and helpful. The room was clean as were the linens and towels. Hotel was right off of I-5 and easy to find. Rates were exceptional, I would recommend the Best Western Alladin Inn to anyone. "Perfect pit stop, Eureka to Anancortes"
8 hours from Eureka, 4 hours from Anacortes Ferry Terminal, perfect place to stop during our trips to San Juan Island. Quiet, clean, and comfortable. Breakfast included but better one at Grounds for Opportunity Cafe in Kelso, 15 min walk from hotel. "Mt. St. Helens-Johnston Ridge Observtory"
This is the closest Best Western to the Johnston Ridge Observatory, so if you're planning on shooting the Milky Way over the mountain, this is your place. Lots of good food in the area as well, and not too far from the Oregon/Washington state line. The hotel is not right on the freeway either, nice and quiet. "Great Staff and Easy Access to Freeway and Town"
Great access to Freeway, but not adjacent, so location is quiet. Rooms was VERY clean. All staff was friendly and well versed in the art of Customer Service. Rate was as expected of Best Western - a little higher than others, but still fair. This property is on the older side and the area is not a typical go-to spot. If you are a "New" addict/snob, this is not the place for you. For those of you looking for a clean and comfortable motel where the staff has customer service skills, this is the place for you. This is an older property. It is clean and comfortable. However, the floors are uneven, especially in the hallways. The soundproofing is weak, especially in regard to the plumbing; you will know when your neighbors use the toilet or shower. It is a safe and comfortable motel despite its aging difficulties. "Clean hotel for the cost!" I have stayed at this hotel many times and it always offers friendly staff, clean room and a great location. The only thing I would let people know is there is always a subtle odor of a light damp smell in the hallways I notice it every time. But I know this just an issue with this area since it always seems to be raining! For the money you can't beat the value of this hotel. Beds was comfortable hotel hall way smelled so bad I had ask for a room sway from the front street I did not get little disappointed hotel staff was nice it is a old hotel Rate was good l would stay again for the good deal. Hi Toshie R! Thank you for taking the time to review your stay at our hotel. We are happy to hear that you enjoyed your stay with us even with odor in the hallway. It was an isolated incident that happened and has since been taken care of. I am happy that we were able to move rooms for you, and that you will stay with us again the next time you are in the Kelso/Longview area. Again, thank you for your review and we hope to see you again soon! Great location for a conference at the fair grounds. Stores and restaurants all in walking distance. Staff was freindly. Room was clean, and comfortable. The breakfast set up was really good. Eggs, hash browns, and sausage. Pasteries, and waffles. And an assortment of cereals. Parking was a little tight with the rest of the search & rescue people staying there. Plenty of entrances where ever you park so the walk is short to get out of the rain. Clean, comfortable and very cost effective. The rooms are getting a little dated but they are well maintained. They some have rooms with full size refrigerators, stoves, kitchens, etc. Britney is great and the rest of the staff is also very good. The parking lot can get crowded on some nights. "Great place to stay during a visit to Mount Saint Helens"
From checking in to checking out everything was great. The staff was the greatest and the Wi-Fi was quick. This was my second stay there and I look forward to my next stay there. There is a great place to eat next door and the Won Ton soup is outstanding. "Great place to stay near Mt. St. Helens"
We stayed overnight here on the way to Mt. St. Helens. It was quite convenient to I-5 and many restaurants and shopping. The staff was friendly and helpful and we were upgraded to a double queen suite. The room was spotless and the pillows and bed were comfy. We had an old fashioned shower head with great water pressure and plenty of hot water. The room was quiet in spite of being near a heavily traveled shopping area. Breakfast included. Stayed two nights for a conference. Great bed, quiet A/C, excellent staff. Breakfast was average self serve: pleasant space, but needs better grade of coffee, jams. Three hot chaffers to pick from; actually hot. 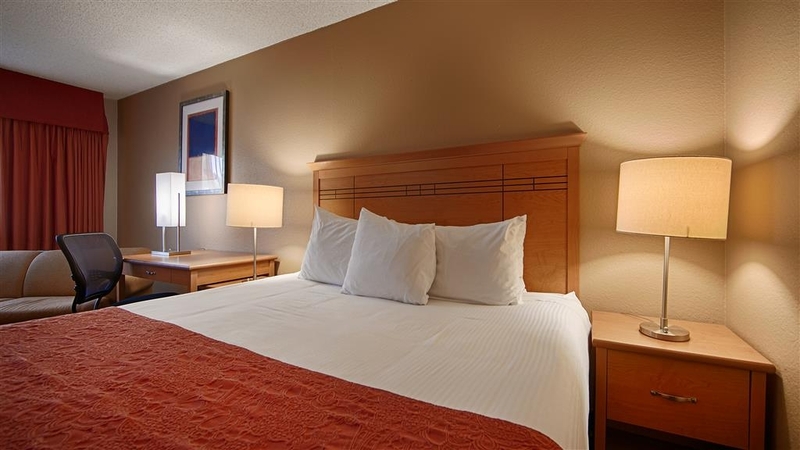 "Great place to stay in Longview/Kelso on a business trip"
Hi Ruth P! Thank you for your review of our hotel. We love to hear that our guests enjoyed the restaurant recommendations made by our staff. There are so many great restaurant selections to choose from. We all love what we do here and it shows. It's great to see that you enjoyed your stay and that you will be back. See you soon! This hotel is a little older but well kept up. Checking in and out was fast and easy. The room had a mini-fridge and microwave, and good wifi. Bed and pillows were comfortable. This is wood frame construction so can be a little noisy as people move about on the 2nd floor. Location is a little inconvenient for the highway and restaurants. Local neighborhood behind the hotel seems a little sketchy. Thank you for your review! We love to hear that our guests enjoyed their stay. While we are only 1.3 miles from Interstate 5, there are several great local and chain restaurants within .5 to 2 miles from our hotel. Again, thank you for taking the time to review our hotel and we hope to see you again the next time you are in the Kelso/Longview area. People friendly, room clean, breakfast good. Room bt staircase noisy, but remodel planned which should cure this. Have stayed here in the past, rooms and people seem to be much improved. Try not to get poolside room as these are noisier. "The Aladdin Inn in Kelso,WA"
When ever we stay in the Longview Kelso area we always stay at this Best Western. The staff is very friendly, courteous, helpful and make you feel like part of their family. It's a very homey feeling you get when staying here. The area is clean and comfortable. I will be returning again soon. Thank you for your kind words and great review of your stay. We all love what we do here and it shows. Our guests are our number one priority and we want everyone staying here to feel like our hotel is a home away from home. Again, thank you for taking the time to review our hotel and we will see you the next time you are in Kelso. The bed was comfortable, the room was big, the furnishings were new. However, you could tell that the building was not new and built with lower quality materials. It was fine, and I slept well. I will stay again. Hi Jennifer! It's great to hear that you had a nice stay, and that you slept comfortably. We appriciate you taking the time to review our hotel and we look forward to seeing you the next time you are in the Kelso/Longview area. My daughter had a volleyball tournament in Kelso and we were just looking for a decent place to stay at a reasonable price. That's what we got at the Kelso BW. We were greeted by very friendly staff and without asking were upgraded to a larger room with a kitchenette. Unfortunately, we were in town long enough to take advantage of the kitchen. Room was spacious and clean, but pretty dated in appearance. Bed was comfortable and room had a flat screen TV. Free Internet had a good strong signal, which I have found is not common in most hotels. Pool was nice, but no hot tub. Free breakfast buffet was pretty much the standard breakfast with sausage, scrambled eggs, waffle, cereal, coffee and juice. Seating in the dining area was pretty limited. All in all, good hotel at a good price. Thank you for your review Kingdog1, we really appriciate you taking the time. We love it when we hear that our guests had a great stay. How great that we were able to give you a upgrade to one of our kitchen suites. Yes, they are very spacious and roomy. We are happy to hear that the wifi was strong, and that you enjoyed the pool and breakfast. We the staff, from the front desk to housekeeping love what we do and we are glad it shows. We hope to see you again the next time you are in the Kelso/Longview area. Nice basic hotel. A little on the older side but it was still a good value. We would stay there again. The breakfast was fantastic. Staff was really nice. The wifi worked very well. The beds were comfortable. Thank you for taking the time to review our hotel Tim W! We love to hear when a guest has had a nice stay, comfortable sleep, great wifi, and a filling breakfast. We recently added to our breakfast menu and we are hearing great feedback, thank you. We love what we do and we are glad it shows. We hope to see you again the next time you are in the Kelso/Longview area. Hi lamondk! Thank you for your great review of our hotel, and your kind words. We love to hear when a guest has enjoyed their stay. We take great pride in what we do and we are glad it shows. Again, thank you for taking the time to review our hotel and we hope to see you soon! If you're staying in the kelso/longview area, this is the place to stay. The staff is friendly and the hotel is well maintained. I have stayed in the red lion hotel in the area, but after 1 stay there, it will be the Best Western Aladdin for me from now on. Great place to stay, convenient but far enough from I5 to be quieter, very clean and comfortable. Fun to walk across the river bridge and into town. Good breakfast at hotel, great coffee shop nearby or walk into town. Hi Tim706! We sure appreciate you taking the time to review our hotel. It is always a joy to see that our guests had a great stay. Yes, we are only a short 1.3 miles from Interstate 5, so it's a easy jaunt to our hotel off 5. We are also pleased that you enjoyed our plentiful breakfast during your stay. We have a large selection of nutritious items and we will be adding more in the near future as well. Again, thank you for your review and we hope to see you the next time you are in the Kelso/Longview area. "Not a great place to stay"
"Nice spacious room, but scary houses behind the hotel.."
We stayed in the hotel one night during a pacific northwest vacation. The staff was friendly, and the room, although older, was quite spacious. We rented one of the rooms with a kitchen suite in it on the 1st floor. Bed was also comfy. The only drawback to this hotel, is the area behind the hotel. There are abandoned houses with unauthorized people obviously living in them. The hotel does have a security service that appears to drive through the parking lot hourly to keep check on things though, which was nice. I think I would select a second floor room if we stayed here again though, and probably not walk around in the back parking lot after dark. Thank you for your review. We are glad to see that you had a nice stay with us while in the Northwest! It's always great to hear that our staff is friendly and that we have comfortable and spacious rooms. While there is a neighborhood near our hotel, we do have security cameras that are monitored 24 hours throughout our property and as you mentioned, we do have security that drives around our property. Again, thank you for your review and we hope to see you again the next time you are in the Kelso/Longview area! "Welcome refuge after long day on the road"
Overnight on way home, glad to find comfortable and warm place to rest. A restaurant across the parking lot meant no more driving. Room was clean and spacious with good wi fi connection. Early breakfast bar was fresh and ready at 6:00 a.m. Without GPS would have been hard to find as it is located some blocks off the I5. Thank you for your review of our hotel! We are so happy to hear that your stay with us was comfortable, clean and warm, with a great breakfast. We hope to see you again the next time you are in the Kelso/Longview area. An ok stop over - fast friendly service, oddly nasty smelling hallway but clean and comfy room. Heating in 1st room wasn't working (and was old-style and noisy) so was moved to another room with an updated heating system - much better! 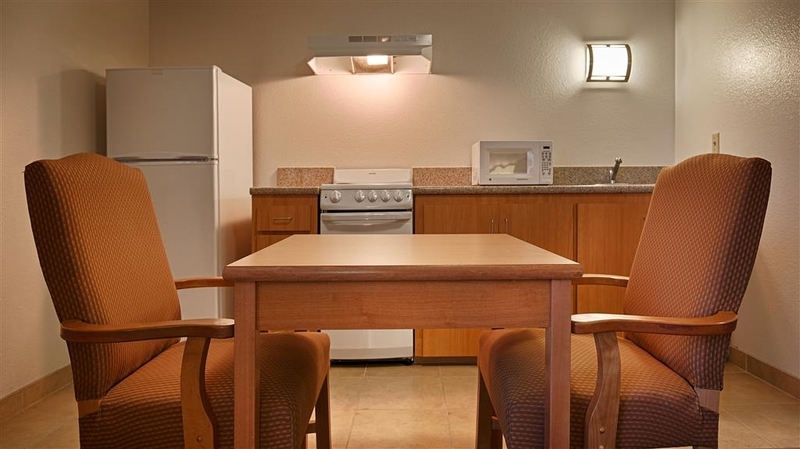 Small fridge and microwave in the room, and a few restaurant options in the area (one adjacent to the property but I didn't try it). It was ok, but I wouldn't make a point of returning. Something just off the Interstate would be faster, easier, and just as good. Thank you for your review of your stay. We are always happy to hear that our guests had friendly service, and a clean and comfortable room. Please accept our apologies for the smell in the hallway. That is not indicative of our standards and I hope that it was brought to our attention so that we were able air the hallway out. We are also happy to hear that we were able to move you to another room with a properly working heating system. Again, thank you for taking the time for your review. If you are ever in our area again, we do hope that you give us another chance to show you a great stay! Thank you for your kind review! We want all our guests to leave the Best Western Aladdin Inn knowing they had a nice stay and we are so happy to hear that was the case for you. I am sorry to hear however that we were not able to recommend a place for you to watch the game and eat breakfast. While I don't believe that there are any breakfast restaurants with cocktail lounges, we still could have recommended several places with that served breakfast that would have had the game on. I will make sure that the front desk staff is ready to recommend those places when asked. Again, thank you for taking the time to review our hotel and we hope to see you the next time you are in the Kelso/Longview area. "Good choice at a good price"
Looking for a last minute place to stay after car problems changed our plans, we found this hotel. The staff was friendly and helpful, and the rooms were comfortable. You do need to request blankets as only one is on the bed. Heater worked fine, we just prefer to put it at a lower setting at night and adjust with blankets. Sink and blow dryer are outside of bathroom, which is nice. Blow dryer is on wall between 2 mirrors, so would be easy for 2 or more people to get ready at the same time. Only problem with room was bathtub drain was slow. Otherwise, very clean. We didn't use the indoor pool, but it looked sparkling clean and inviting. Breakfast was good with fluffy eggs (not the weird egg disks that some hotels serve), country potatoes (chunks, not shredded) and sausage. Waffle maker makes 4 small waffles, which is much easier to handle, especially if you have little kids, than one ginormous one that covers the plate. Lots of selection with cereal, yogurt, and hot oatmeal. Very reasonable price for a Best Western, and we would definitely stay again if we were in the area. Location is good, away from freeway and about a mile from several restaurants and the mall. This is an older property and as such it was not bad...the staff were very considerate and overall the place was clean. We were just passing through on our way south and so we tend to look for Best Western properties when in unfamiliar locations. Came to watch granddaughter play in LCC basketball tournament. Aladdin offered a special price and accepted pets, so we did not have to kennel them; consequently, a good value for us. Without special price, I might have kept looking. Good location. Interior "worn" but clean. Single queen room small or cozy depending upon your viewpoint. Very friendly and helpful staff (reason for very good rating; otherwise, average). "Great spot to stay in Kelso WA"
While a bit off the I5 the Kelso Best Western is a great place to stay. Clean and quiet (ask for a room at the back). The staff are friendly helpful and courteous. Unbidden we were offered a free upgrade. Much appreciated. The usual BW complimentary breakfast is served in a clean well organised breakfast room with all the usual items; scrambled eggs, sausage, hash browns, cereals, bread, muffins buns etc choice of juices, milk, coffee and so on. Priced right. The room was adequate for a one night stay since we were traveling on the next morning. The first room we were assigned had a very strong cigarette smell. When I reported this to the desk clerk she moved us to another room which was OK. The motel is old and has a musky smell about it. After you have been in there awhile you don't notice the smell that much. The bed was comfortable and the breakfast had several options. I think it is overprice for what you receive. First, let me thank you for taking the time to review us. Second, let me apologize for your less then great stay. While we are strictly a non-smoking hotel, guests have in the past still smoked in their rooms. We are very sorry that a room was rented with out being deep cleaned. I am happy to hear that we were able to move you to another room and that you had a comfortable sleep. We do hope that you give us another chance to make a great impression the next time you are in the Kelso/Longview area. I've probably stayed here close to a dozen times. It's easily the best value in the Kelso/Longview area. It's not the most trendy or up to date decor. But, It's very well maintained, well run, clean and comfortable. Parking is a bit limited and their is no elevator (Ask for first floor if that matters, it's NOT noisey). The only restaurant that's really close is a Chinese place that I have not tried (not my thing). There are plenty of restaurants within a few blocks to a mile or so. Thank you for your taking the time to review our hotel. We are happy to hear that with all the choices in town, you choose us for your lodging needs. While you are correct we have no elevator, we do ask guest when making a reservation and they need to be on the lower floor to note that in the comment line or to let us know if they call. We are more then happy to make sure they get a room on the bottom floor if it is available. Again, thank you for your stay and we hope to see you again soon. This Best Western was ideally located for restaurants in Kelso WA and also for our medium sized group that was attending and performing at Halloween Town in St Helens OR. This Best Western says it is just the normal type, but we felt like we were in a Best Western PLUS. We had a little kitchenette with microwave, refrigerator, and kitchen sink. The Queen beds were very comfortable with good pillows. Only issue was bathroom fan did not pull out the steam from vanity area quickly enough (after shower). "Rooms smell bad & broken equipment." I had to change room because first room smelled bad. Second room was better, but still smelled bad. Hallways smelled bad also. Toilette was broken and wobbled when sat on! Bathroom fan was broken and extremely loud. Phone didn't work! I cancelled my reservation for the second night & went to the Red Lion instead. Nice clean motel in Kelso. Breakfast was good. Room was priced fairly. Quiet place and the room was really clean and neat. Nice place to stay. Kind of hard to find as it is about 2 miles from the interstate hiway. If you are going to Mt. Saint Helens, good place to stop for the night. We came for a wedding (my nephew's) and this suited us well. The room was clean and well-furnished, the breakfasts were tasty and wholesome, and it was near a number of businesses. The bathroom plug and the TV setup were both a bit confusing, and I couldn't get the internet in the room to work. (The computers off the lobby did, however, so all was not lost for my internet addiction, LOL!) Did have trouble finding it, too. Overall, tho, I found it an enjoyable experience, and would recomment it to others. We were visiting friends in Kelso and there was not much of a choice because of weekend festivals. This was a good basic hotel at a fair price. Nothing fancy but the staff was nice and the rooms were clean. Wouldn't stay at this particular Best Western again should we return to WA state. The young woman who prepared breakfast was fantastic and did a wonderful job. Hats off to her! Staff at front desk were not that helpful when trying to bring in several pieces of luggage on one of their carriers. . . .holding door open for us, etc. Thank you for your review of your stay. We are very disappointed as well to hear that our staff did not offer to help you with your luggage or hold the door open for you. Please know that we will speak to all our staff regarding your situation and what it means to give superior guest service. Please accept our apologies. But we are happy to hear that you did enjoy breakfast. we really do hope that you give us a second chance the next time you are in our area. Nice room, good breakfast, fantastic front desk person at check in. The room was clean and comfortable. Quiet and dog friendly Not much area for dog to do it's business but hotel is located in a quiet neighborhood. where you can walk your dog. Thank you for your kind review, we very much appreciate it. We love hearing that our guests had a good stay, enjoyed breakfast, and had great service. We hope to see you. "Poor location, small old-fashioned rooms"
Located a long way from the freeway in a seedy area. Only one handicapped parking space, at the front, for the entire hotel. No restaurants of note nearby. Our room was small, old fashioned,but clean.WiFi was OK. TV, fridge, but no freezer in fridge. Bathroom was tiny, with old-fashioned small toilet, with loose toilet seat. Non-slip strips in tub were peeling off. Breakfast was good, with good service, and the room was clean. There was nobody at the front desk when we tried to check out the next day and other staff had to hunt the receptionist down. Thank you for your review. We want all our guests to leave our hotel knowing that they had a great stay and we are very sorry to hear that was not the case for you. While we are only 1.5 miles from Interstate 5, it may seem longer after a long drive. We do have two ADA parking spots, perhaps the other one was being used when you checked in. While there is a restaurant next to us, there are several fast food and chain restaurants such as Applebees within a mile of us, as well as great local ones too. We are happy to hear that you enjoyed breakfast, and had good service. Again, thank you for your review, we hope that you give us a second chance the next time you are in our area.